How could I throw a Shark Party without a colorful blue punch?! While I am the gal who makes sure to put lots of beverage options out on the counter during a party so people have plenty to choose from, I am also the gal who can’t help but create a fun and colorful drink to match the decor and theme. I can’t help it. It’s such an easy touch to add. 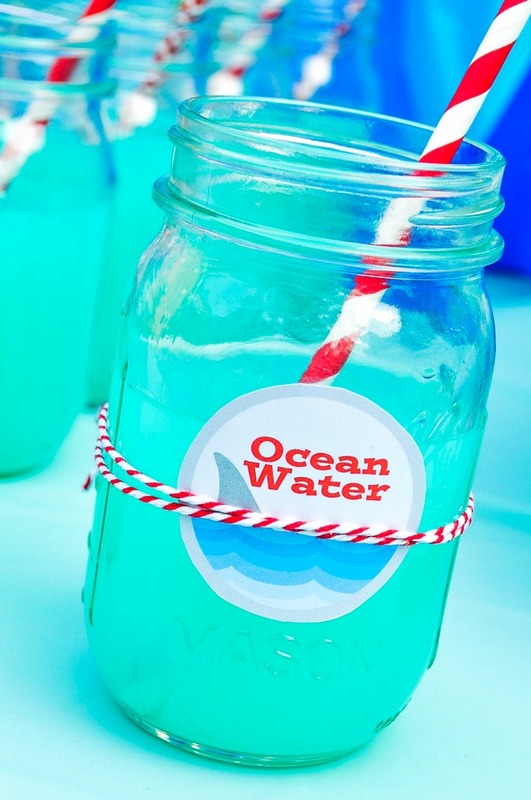 For the Shark Party, creating a blue punch was the obvious choice to make “Ocean Water”. Serve with ice and toss a Swedish Fish inside if you want to add an extra little touch. 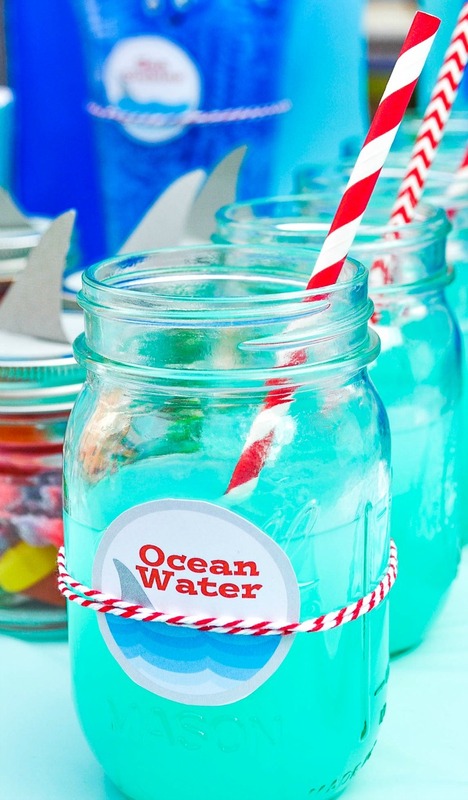 Even if you are not hosting a Shark Party, this is the perfect summer punch! 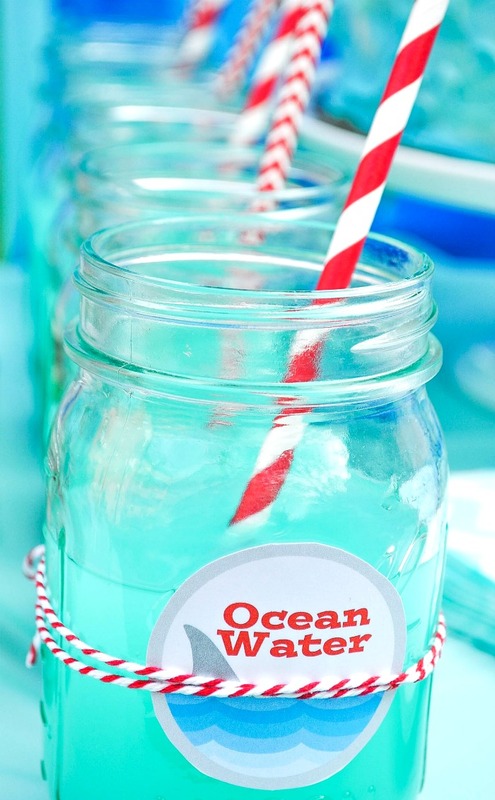 It is sweet, refreshing and a gorgeous aqua color. My husband and I might be drinking these pool side tomorrow on our day off, though me might make them adult by adding a little bit of Vodka into the mix. But if you WANT to hold a Shark Party or Ocean Party, make sure you stick around. I have already shared a Shark Bait Popcorn Party Mix and will be sharing more details soon! Speaking of summer – head down to the bottom of this post for a chance to win a FREE KitchenAid Mixer with an ice cream attachment. Pour everything in together and stir! DONE! Hi! I’m looking to make this for my sons birthday party and I was just wondering what the packet of Koolaid is. How big and is it add sugar or what? Lol. Sorry there are just a few different things I could get that are Koolaid. I was hoping the ‘just add water’ stuff would work! Thank you! I used the traditional packet size which I believe is .14 oz and used the flavor of Blue Raspberry Lemonade. I personally did not add sugar. The recipe is above in the post. Thank you! THis is so wonderfully simply and perfect to actually bring to the beach for a party. My kids will love it!